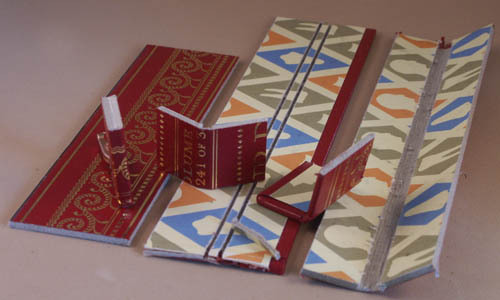 Richard Tabor has developed a wonderful method of making mini faux filler books using old damaged or discarded hard cover books. This is ideal for making a lot of books that will not be displayed opened but placed on a shelf, bookcase or in a library scene. He has kindly given me permission to include a description of his technique and some of his photos in this tutorial. 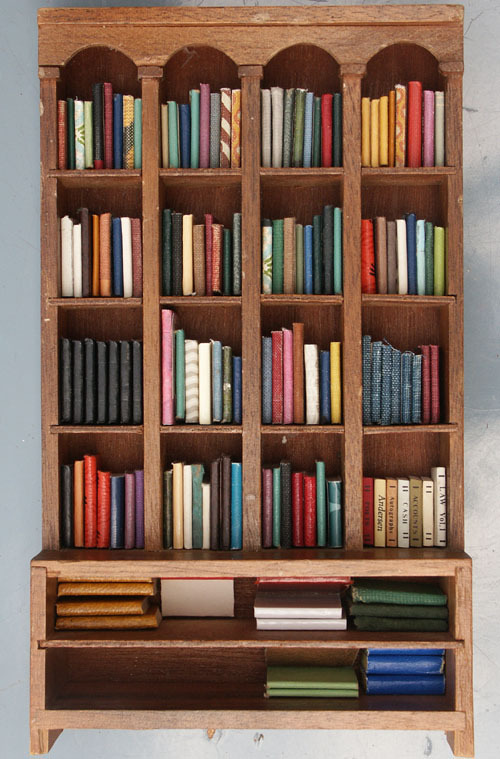 Decide on the width for your finished books. Measure in from the front finished edge and draw a line. Using a straightedge and a sharp boxcutter or similar knife cut along your line cutting off a strip. It may take several passes. Cut across your strip to make books the height you want for your finished mini books. The finished, covered edge is the spine of your faux mini book. 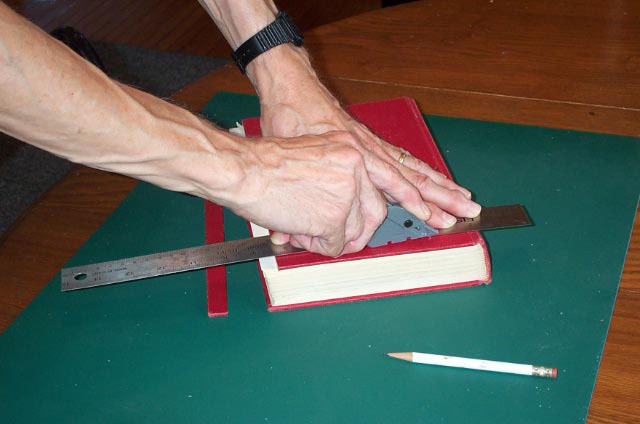 After cutting off your first strip continue in the same manner to cut strips from the other finished edges of the book cover. You can easily vary the width and height of your faux books by changing the width of the strips and crosscut heights. Robin has developed a method of making thicker faux books using the remaining part of the cover, or the edges if you like. 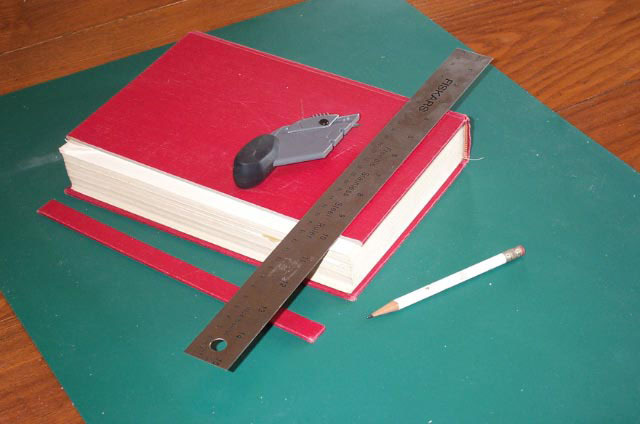 Measure the thickness of the book cover. You will be cutting a strip of book cover twice the width you want your finished book + twice the book cover thickness. From the wrong side, find the centre of the strip and draw a line on either side of this equal to the thickness of the cover plus a tiny bit. You will then want to make 2 cuts on these lines to form a 'slot' down the centre of the strip being careful not to cut all the way through to the finished side. Remove layers of paper bookboard from the slot leaving a thin layer of paper backing the right side of the cover. Fold strip in half to check fit. If the slot is too narrow, the 'spine' will be tight and a bit of a curve to the spine looks more natural. Glue the inside of the folded strip to form a book strip. When dry, cut this strip according to the height you want your finished books. You can vary the finished spine width by peeling off layers of bookboard before you do your measuring and cutting.